Gamewright is a publisher of children's books. Some of the books published by Gamewright include Bzz Out: A Honey of a Numbers Card Game with Cards and Other, Frog Juice: A Clever Card Game of Spells & Concoctions with Cards, Chomp! 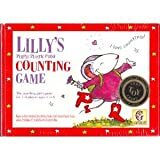 : The Fast and Furious Food Chain Card Game with Cards, and Lilly's Purple Plastic Purse Counting Game: The Matching Pairs Game with Other.